PRODUCT DESCRIPTION: All natural skin cream designed to take away the discomfort and "itch" following the initial reaction from insect bites, burns, wounds, eczema, acne, dermatitis and more. 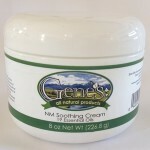 ACTIVE INGREDIENTS: The actives used in this cream include aloe vera, shea butter, almond oil, neem, karanja oil, lavender oil, peppermint oil, lemon grass, tea tree oil, sage oil, camphor oil, rosemary oil, eucalyptus oil and spearmint oil. WHERE TO USE IT: Feet, legs, arms, hands, neck, and any just about any exposed skin area which has received a bite or sting. For topical treatment only. RELATED PRODUCTS FOR PEOPLE: FLEA REPELLENT (aerosol spray).